Grab the vacuum cleaner… it’s cosmic DUST! Among the many wonders of the Universe, there is dust. Yes, that’s right. Dust! I am not talking about the dust under your bed, although dust is really ubiquitous: it can be found in the interstellar medium of a galaxy, in our Solar System, in stars themselves and there is mounting evidence that it can also be found in the intergalactic medium, as this study by Ménard & Fukugita confirms. Where does the dust in our Universe come from? We think it forms from metals that are synthesized in stars through fusion, or in supernova explosions. This material is expelled into the interstellar medium by the explosion itself, or by stellar winds. If we know how many stars form in galaxies over cosmic time, we should be able to predict how much dust has accumulated in them by today. 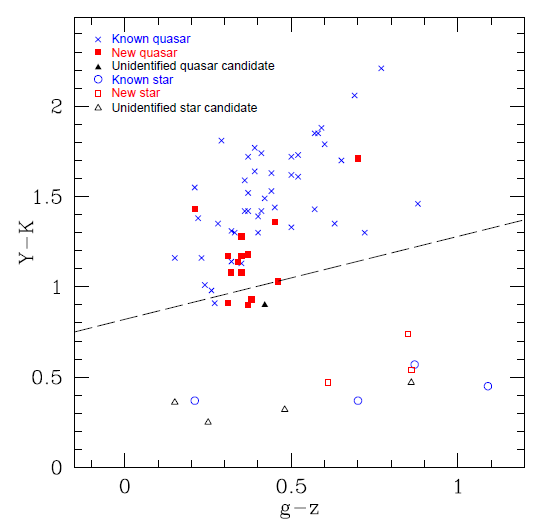 Just recently, Fukugita made this prediction and compared it to the observed amount of dust in galaxies in this paper. The result suggested we were missing dust! Galaxies should have produced about 2.5 times more dust than we observe today. Where did the rest go? The answer may lie in dust being expelled from galaxies out to scales of a Mpc. Certain clouds of gas around galaxies can be used to probe the range of scales from the disk to the limits of the gravitational potential of the halo. Although these clouds do not form stars, they can be detected through Mg II absorption against the background light of a quasar. The cloud will act as a screen where the incoming quasar light will be transformed due to several physical processes into the spectrum we observe. These processes are absorption and scattering of photons by dust grains, ionisation and excitation of hydrogen atoms and the excitation of metals. By modelling the spectrum, one can determine the composition of the cloud. The goal is to determine whether there is dust present at all in the cloud and how much there is. To achieve this goal, we first need to make some assumptions about the type of dust present in the cloud. The authors have two alternatives: models of the dust in the Small Magellanic Cloud and in the Milky Way. We also have to assume the composition of the metals in the cloud, which they obtain by constructing a composite of absorption spectra of Mg II clouds. This is to say they are assuming all Mg II clouds on average have the same composition of metals. To actually measure the amount of dust, they take the observed colors of the quasars that lie behind a Mg II absorber and compare them to the colors of other reference quasars. From this they can estimate the extinction acting on the spectrum of the quasar. Since the extinction in a given photometric band can be affected by the presence of metals in the cloud, the authors restrict their analysis to the photometric bands where the extinction by dust is expected to dominate. It is also important to determine the proportion of dust to neutral hydrogen and compare it to that of the interstellar medium. From this, they can learn whether the Mg II clouds are made of gas expelled from the galaxy or whether they are reservoirs of gas that has not yet gone through any star formation. The novelty of this work is that the authors use both optical and UV information (from SDSS and GALEX), and it is the addition of the UV that allows them to constrain the amount of hydrogen in the cloud, since hydrogen absorbs Lyman photons in the UV. Given the abundance of Mg II absorbers in a certain redshift range and the amount of dust in them, one can integrate over redshift to obtain the amount of dust contained within galaxy halos as a function of cosmic time. However, there could be dusty clouds in galactic halos that do not produce Mg II absorption and this technique does not account for those. In addition, if a quasar is too heavily obscured, it will not be possible to observe its spectrum at all. Therefore the authors are only able to obtain a lower limit on the amount of cosmic dust from the study of Mg II absorbers. In the end, the authors summarize the result in their Figure 7, which we reproduce here. In that figure, Ωdust is the ratio between the density of dust at a given redshift to the critical density of the Universe today. The amount of dust in Mg II clouds shows a slight increase with cosmic time, although, as we mentioned, these are only lower limits. It is about a third to half of that expected to be produced by galaxies. For this amount of dust to be observed in the MgII absorbers, it must have accumulated for a while in the absorbers, at least a few Gyr. 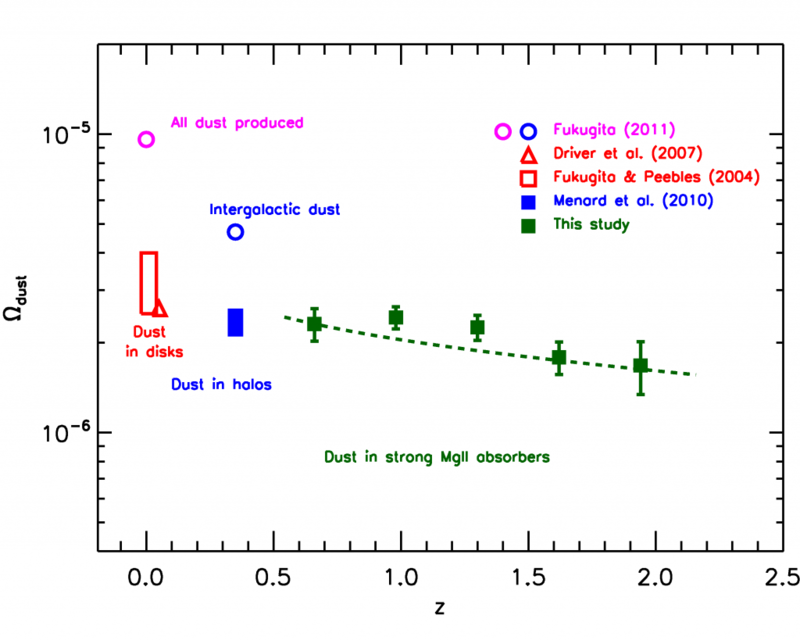 Finally, Ménard & Fukugita estimate the amount of neutral hydrogen contained in MgII clouds and they estimate the dust-to-gas ratio is around 1:100. This is consistent with that we observe in galaxies and suggests we are observing gas that originated in the galaxy and was expelled from it. The evolution of the cosmic density of dust as probed by different observations. The results of this paper are shown in green and represent only a lower limit to the cosmic density of dust. The dashed green line is the cosmic dust density of Mg II absorbers obtained from parametrising their redshift distribution. Figure 7 from Ménard & Fukugita (2012).